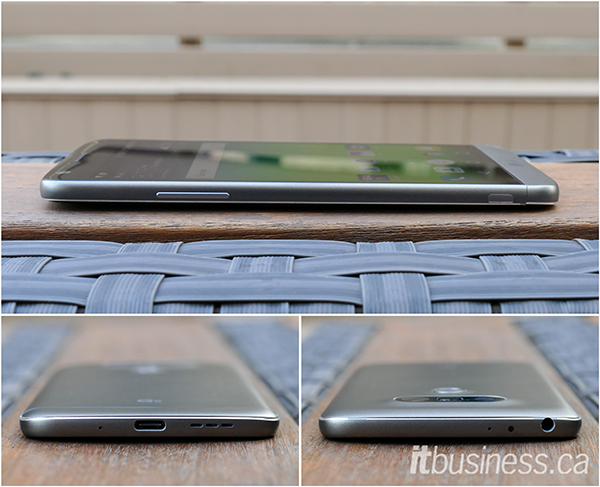 Last year we included the LG G4 as one our 2015 Top Business Smartphones, and were impressed with its camera and the fact that LG resisted the trend of non-removable batteries and no microSD card slots that impacted its competitor’s phones. However, we were disappointed to see LG stick with mainly plastic for the G4’s construction, and it lacked a fingerprint reader, a feature we consider a must for a modern business smartphone. For 2016, LG is back with the new G5, and like its predecessor, it still has a removable battery and microSD slot, which is especially impressive because, with the G5, LG is offering an all-metal device. 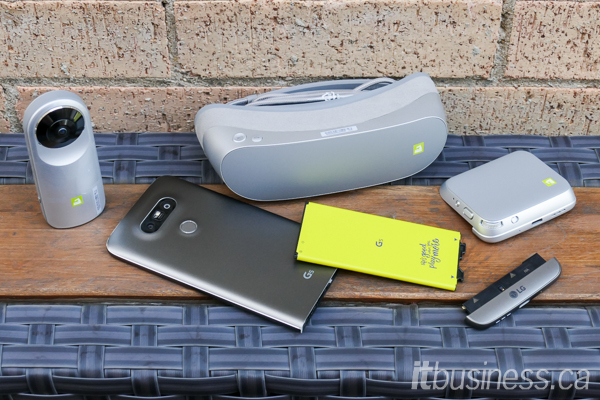 In addition, the engineering required to facilitate the removable battery allows LG to offer modular components you can attach to the G5, a first for a mainstream smartphone. On top of that, it has a new dual-lens camera and finally a fingerprint reader. Read on to see why we think it’s one of 2016’s best phones. & Colour Metal and Gorilla Glass 4. Availability & Pricing Bell, Fido, Koodo, MTS, SaskTel, Rogers, Tbaytel, Telus, Wind Mobile and Videotron. Starting at $200 on a two-year term, $750 outright. The LG G5 is a device of many firsts. It’s LG’s first metal unibody smartphone; it’s the first metal unibody phone with a removable battery, and it’s the first modular smartphone to be made widely available. The G5’s metal body is well-made and almost up there in quality with the leading crafters of metal phones, Apple and HTC. The body is shaped so it’s comfortable to hold, with the edge of the back and its sides both being curved. It comes in two colours, Silver and Titan, and we prefer the darker shade, which is what we tested and is pictured in this review. Size-wise, it’s average for a 2016 smartphone, bigger than the Galaxy S7 and HTC 10, but a little smaller (in width and thickness) than 2015’s LG G4. The G5’s Quad HD 5.3-inch IPS LCD screen uses LG’s Quantum Display tech for improved contrast and brightness, and its “Daylight Mode” pumps up its output to 60 per cent above normal to an incredible 800 nits (only for a short period, though, so as not overheat the phone). The G5’s screen is definitely the most readable in sunlight of any phone we’ve tested. Another design feature we appreciate is the curve of the screens glass towards the top of the phone, which makes it more comfortable when holding it up to your ear. Of course, the star of the G5’s design show is its removable 2,800 mAh battery shown in the picture above. Pushing a small button on the side of the phone releases the area below the display allowing you to slide the battery out. You can also see the fingerprint reader above, located below the dual-camera setup. 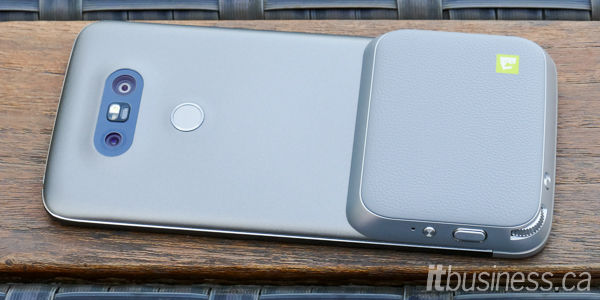 It also doubles as a power button, though unlike previous LG “G” phones, the volume controls have been moved from the back to the side of the phone. Performance-wise, thanks to its Snapdragon 820 SoC, the G5 is one of the best performing phones we’ve tested and is comparable to the similarly equipped HTC 10 that we recently reviewed. When you compare the results above to those of its 2015 predecessor, the G4, it’s clear that the is a big step up. Last year LG compromised its flagship’s performance by not going with the top-end processor and thankfully it hasn’t made the same mistake twice. It’s also good to see that the G5’s battery life has improved over its predecessors, despite having a smaller battery (2,800 mAh vs. 3,000). 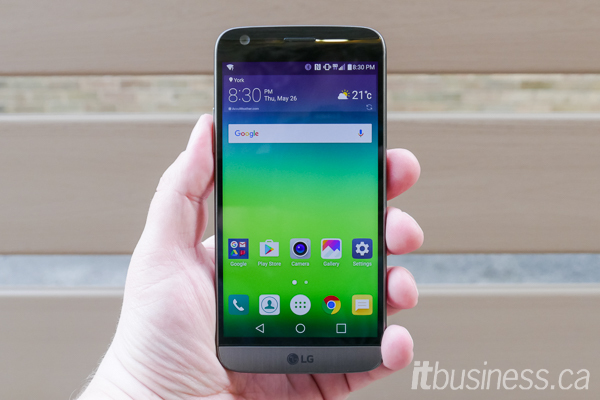 The G5 runs the latest version of Android, 6.0.1 Marshmallow, and sports version 5 of LG’s user interface. This new version has been visually refined with new icons and a white background with black text for the notification panel and system menus. As is the trend with other Android OEMs, LG has continued to pare back the number of superfluous applications and features in its UX, and the G5’s software feels very smooth and responsive. Importantly for business users, the G5 now supports Android for Work, making it suitable as a BYOD or COPE device. This is a critical feature that was missing from the G4. Primary LG G5 16 MP camera sample image. Secondary LG G5 8 MP wide-angle camera sample image. 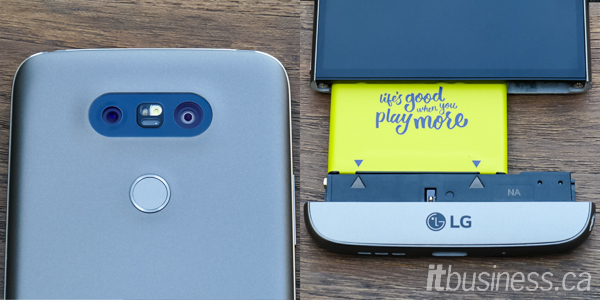 Along with facilitating a removable battery, the design of the G5 allows it to accept modular components, and the first one to be available in Canada is the LG Cam Plus camera grip ($100) shown in the two images below. The Cam Plus snaps onto the G5 and adds a two-step physical camera shutter button and zoom wheel, along with a 1,200 mAh battery to boost the G5’s total capacity to 4,000 mAh for more shooting time. You can also see below some of the other accessories available for the G5 such as the LG 360 Cam 360° camera that you control with the phone and the LG 360 VR headset that hooks up to the G5’s Type-C USB port. Although the G5’s unique design allows it to be the only metal smartphone with a removable battery, this feature does lead to an issue with the fit and finish where the phone breaks apart, with the seam being clearly visible. This design choice also prevented LG from adding any element protection, something its main competition, namely the Galaxy S7, has. 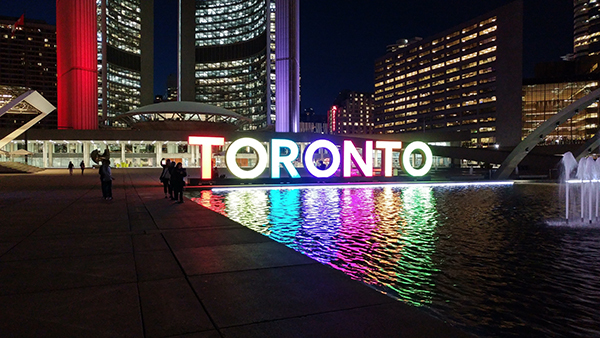 The G5’s screen, despite being very bright, is poorly calibrated with inaccurate colours, and its always-on feature (that displays the time, even when the phone is off) is too dim and unreadable under outdoor light. Despite the improvement in battery life over the G4, when compared to some of its 2016 competitors, the G5’s could be better. 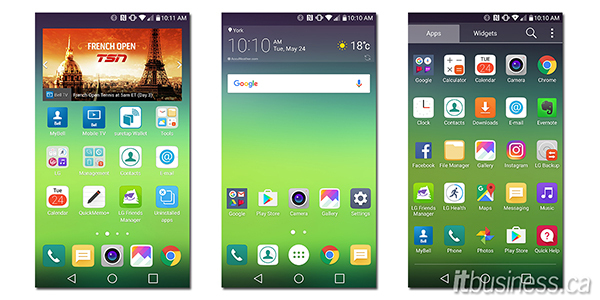 Also, LG’s new UX 5.0 software was one unusual feature – its default launcher doesn’t have an app drawer, so all your application icons live on the home screen. Thankfully you can switch to a more standard launcher in the G5’s settings. The G5 is a very impressive smartphone. LG has managed to build an all-metal phone while still offering a key feature that differentiates it from its competition, a removable battery. This feature also allows it to use unique modular components, and although there is only one right now, we’re sure LG will release more that will expand the functionality of the G5. In addition, it still has the same excellent camera as the G4 along with another unique innovation, a secondary wide-angle camera. Most importantly, all this innovation is available for significantly less money outright than its competitors, which are at least $150 more expensive. 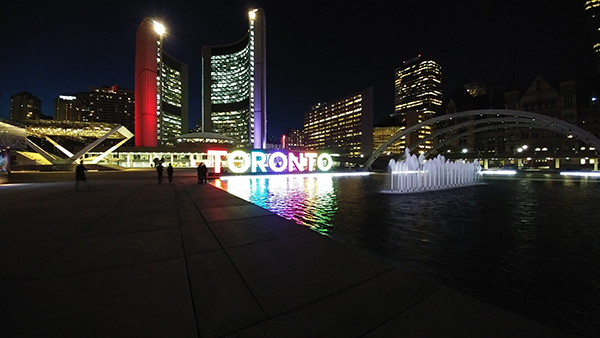 The LG G5 is available from Bell, Fido, Koodo, MTS, SaskTel, Rogers, Tbaytel, Telus, Wind Mobile and Videotron starting at $200 on a 2-year term and $750 outright. Highs: The first mainstream modular phone, an all-metal device with a removable battery, excellent camera with innovative secondary lens, outstanding performance, improved software over its predecessors, less expensive than other flagship smartphones. Lows: Fit and finish issues of modular components, no element protection, finicky fingerprint reader, poorly calibrated display, average battery life, software defaults to launcher with no app drawer.